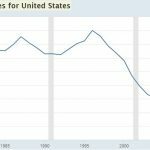 Even though the economy should grow strongly in 2018, at least in the United States, there are some warning signs of a potential recession we will discuss. It’s always important to understand both the bullish and bearish case for equities and the economy. When the economy looked terrible and potentially recession bound in early 2016, it was actually a great buying opportunity. The market and economy can shift quickly. 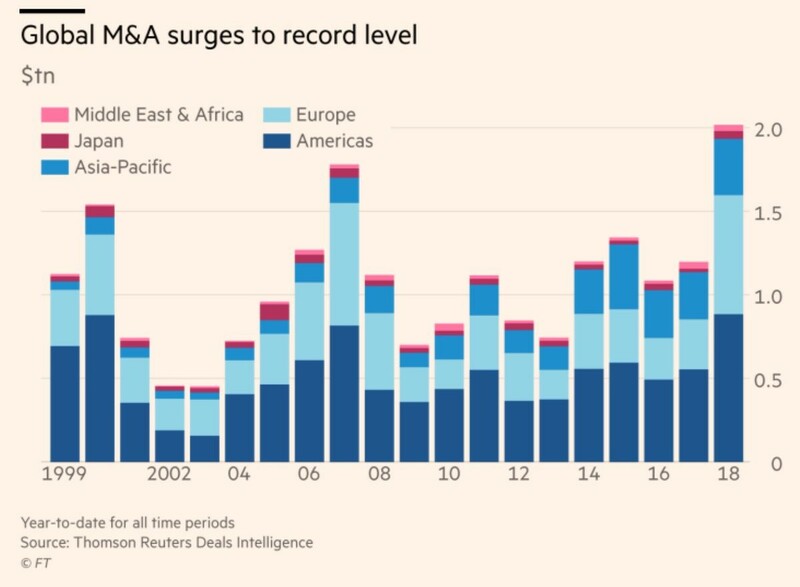 The chart from the Financial Times below shows global mergers and acquisitions have soared to a record setting pace in 2018. This compares year to date 2018 M&A activity with the same time frame in each prior year. The Americas, Europe, and Asia Pacific are all seeing heightened M&A. Even though M&A activity is good for stocks in the short run because it provides demand for them, usually when activity intensifies, it’s a sign optimism and economic activity is near the peak for the cycle. 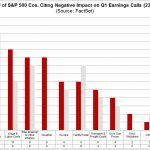 In a Fortune 500 CEO poll, 48% of CEOs said they think the economy will be better in the next 12 months than it was in the last 12 months. That’s a fairly strong claim as the economy has rebounded nicely from the weakness in 2016. 2017 was the year of ‘global synchronized growth’, so topping that is tough. 63% of CEOs don’t think there will be a recession in 2 years. This is the type of unbridled optimism that causes such big M&A deals. 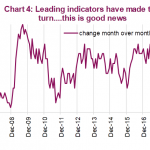 Just because they are so optimistic doesn’t mean they will be wrong and just because M&A is spiking doesn’t mean it can’t spike even higher in 2019, but these aren’t signs you see at a bottom of the market, obviously. The yield curve seems to indicate that a recession actually can occur in the next 2-3 years, so we’re not as confident as these CEOs. When asset prices are rallying higher, it looks like there will never be another bear market or recession again, yet one always occurs because markets, like nature, is cyclical. Signs of a top are when headlines claim stocks will never fall again like the ones that were written in January 2018. That might not have been the cycle top, but it has at least maintained its stature for 5 months which is significant given the unrelenting rally in 2017. The final poll we’ll cite is that 82% of CEOs expect to hire more employees in the next 2 years. They are willing and ready to expand their businesses, but those hires will become layoffs if the economy shifts negatively in the intermediate term. The KKR chart below shows the implied default rate for high yield bonds is 0.4%. That’s probably not a great bet as defaults will increase in the next recession. In fact, default rates spiked in 2016 even without a recession because the frackers dominate the junk bond market. Buying junk bonds at this point in the cycle is picking up quarters in front of an oncoming train. 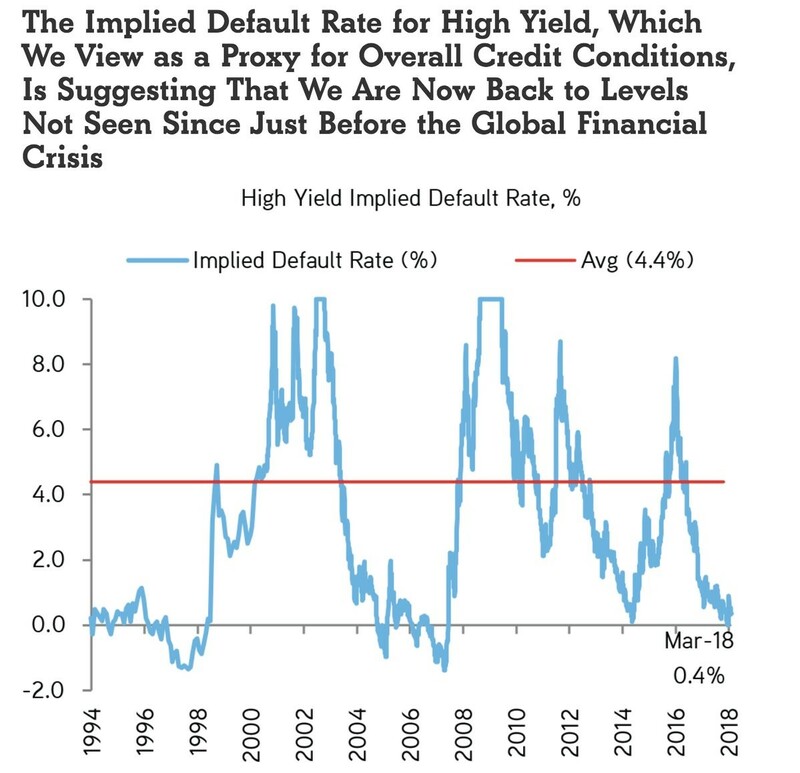 The chart emphasizes that the cycle is as good as it gets as the implied default rate is back to the levels seen before the financial crisis. To be clear, this isn’t an immediate sell signal as these calm financial conditions were maintained for a couple years before the financial crisis and a few years in the 1990s. 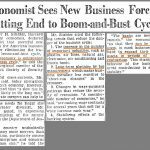 Could A Recession Not Be The End Of The World? Recency bias makes investors believe that the next recession will cause the S&P 500 to fall at least 50%. In fact, because this will likely be the longest economic expansion since 1854 and is already one of the best bull markets in history, some investors think that means stocks will fall even further than the last two crashes. However, that could be misplaced fear. What goes up doesn’t necessarily fall to the mean. To be clear, in a previous article we discussed how on average a bear market takes away 50% of the bull market gains. The chart below from Macrotrends is interesting because it shows the S&P 500’s performance in all the recessions besides the one that started in 1929 and the one that started in 2007. 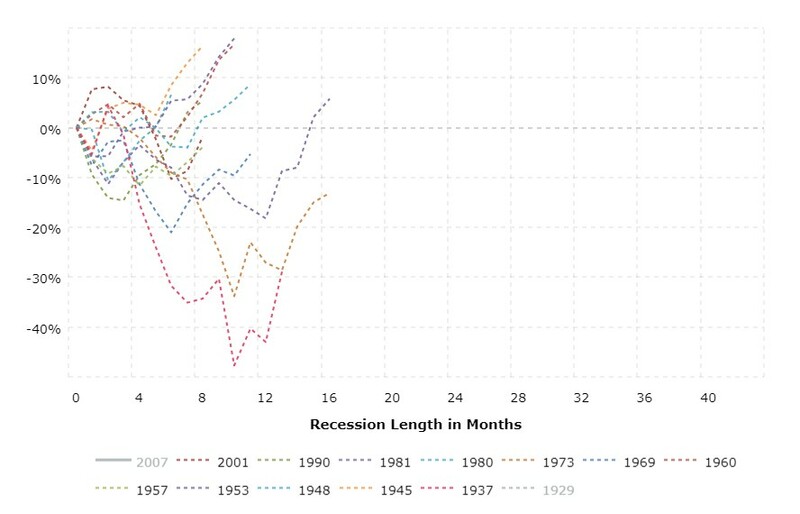 Excluding the two worst recessions, the S&P 500 performance doesn’t look that bad. Excluding our recency bias, and judging by historical context, its feasible that stocks only fall somewhere between 10% and 30% during the next recession. To be clear, stocks can fall out of a recession. The biggest example of this is the tech bubble peak as the stock market fell sharply before the weak recession hit. This is all simply food for thought to suggest the possibility that stocks won’t fall more than 50% during the next recession. Past performance isn’t a guarantee of future results, but it’s still valuable to review. The chart below obtained from Twitter shows the percentage chance owning the U.S. stock market will be profitable in various holding periods. The longer you hold, the better chance you will make money. The lesson here is that if you need your capital in the short term, it could be a good idea to sell now to avoid losses. The cycle is near it’s end, so if you need the money in the next 3 years, it’s a good idea to begin to take profits. 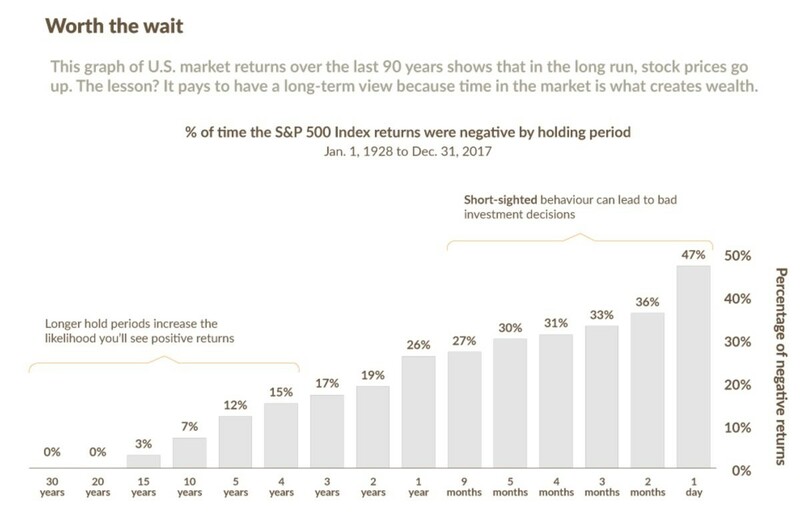 The chart suggests there’s a 17% chance of a loss for a 3 year holding period, but the percentage could be higher now since this is already one of the longest and greatest bull markets ever. In this article we showed reasons why the peak of the cycle could occur as early as this year. If you’re owning stocks for the short term, it could be a good idea to sell now to lock in your gains. It’s also a risky bet in general to own stocks if you need the money in the near term. On the positive side, recency bias makes you think stocks will fall 50% or more in the next recession, but that hasn’t been common in the past 89 years. We’ll leave you with the chart below from Bernstein as more food for thought. 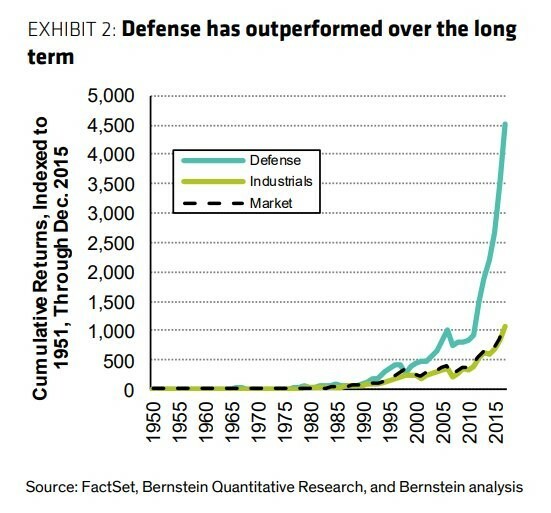 Even though there hasn’t been another world war, defense stocks have outperformed industrials and the overall market by over a factor of 4 since 1950. Selling to the U.S. government is a great business as it has access to the US taxpayers’ money. Considering the current fiscal deficit, as we discussed in a past article Government Won’t Save You, it will be interesting to see if this trend continues.